Tag Heuer took to its social media accounts today to give us our first look at its forthcoming Android Wear smartwatch. Shrouded in shadow, we can't see much of the watch, seemingly called Connected, except for a button on the side and minute markers along the watch face edge. We can also barely make out a sleek black band for the wrist. The company posted the image you see above on its Twitter account along with the line, "Get ready to experience the next step in innovation. #connectedtoeternity." A link in the tweet takes you to a countdown ticker on the company's website leading up to November 9. Over on its Instagram, Tag Heuer revealed it will unveil the new watch in New York City on that day. 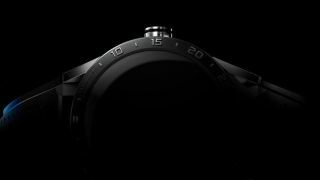 Tag Heuer's CEO said in September that the luxury watch maker would reveal its Android Wear smartwatch on November 9, so that date is nothing new. He also said at the time that the watch will cost $1,800 (about 1,172, AU$2,445). The most expensive Android Wear watch to date is the Huawei Watch, which tops out at $799 (€699, about £515). For more comparison, the LG Watch Urbane costs $349 (£259, AU$459). The Apple Watch starts at $349 (£299, AU$499) and goes all the way up to $17,000 (£13,500, AU$24,000). While Tag Heuer's timepiece won't be as expensive as Apple's most pricey option, it does beat out most Apple Watch models on the sticker-shock front. To slightly make up for the price, the new watch is said to have a battery life of up to 40 hours on a single charge, a really impressive figure. Tag Heuer got a little help from the maker of Android Wear when it came to revealing the new watch's name. The Android Twitter account retweeted TH's initial post, adding, "We can't wait - Tag Heuer Connected powered by #AndroidWear." All that remains to find out about the Tag Heuer Connected is what it really looks like, specs and a release date, but we'll know all in less than a month's time.